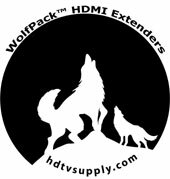 HDTV Supply's WolfPack HDMI Over CAT5 Balun is a simple, low cost system tested to deliver 1080p at 300 over standard CAT5/6 cables. The HDMI Extender over one CAT5E/6 is a tool for extending your HDMI signal over long distances to a compatible HDMI display. Instead of using expensive HDMI cables, a CAT5E/6 cable can be utilized to perform advanced functions like transferring Deep Color (12 bits/color) high definition 1080p video and digital audio with a bandwidth up to 225MHz. The transmitter equalizes and recovers incoming TMDS data before re-transmitting it in optimal quality regardless of the incoming signal quality. The HDMI Over CAT5 set converts HDMI to standard TCP/IP and transmits the signal over your local area network or a single CAT5e/6 cable, whatever you choose. The great advantage of converting HDMI to TCP/IP is that you can now send HDMI over your entire network freeing you of the typical limitations found in send/receive point-to-point systems. The HDMI Over CAT5 delivers unparalleled performance in PRO-AV projection networks, digital signage systems and educational streaming applications. Now your network is your HDMI network! Uses one CAT5E/6 cable for data/DDC transmission. Equalizes and recovers the incoming TMDS data before re-transmitting it in optimal quality regardless of the incoming signal quality. Cable testing showed that with 1080p resolution the HDMI input source can be 20 meters away. When transmitting a signal in 1080p resolution the CAT6 operating distance is 100 meters. NOTE: The Remote IR works with 1-source & 1-TV and the remote IR is not compatible with our matrix switchers remote IR. The HDMI to CAT5 set is designed to convert an HDMI signal to standard TCP/IP and then transmit by an Ethernet internet cable to the supplied receiver. The HDMI to CAT5 extender used an M-Jpeg technique to process image compressing with little image loss, even at 300 feet. The HDMI Extender also supports IR re-transmitting, so you can control the source device which which can be 100 meters away. You can also use the IR extender capability and control your source device from the viewing location. The Unique Backward-IR Channel allows you to control devices at the viewing location from the source equipment location. The target plugs into adapter at the end of the HDMI cable that connects it to the display and inserts IR over the HDMI cable back to the transmitter. See pictures in the above MORE PICTURES Tab. Why not buy this HDMI over CAT5 today? The transmitter has a static IP address and can pair with multiple receivers (up to 253). Multiple transmitters and multiple receivers can be paired on the same network. The extender uses M-JPEG technology to process image compressing. Sender - 4" × 2-3/4" × 1"
Receiver - 4" × 2-3/4" ×1"
A: The IR repeater works well with 36 KHz single band remotes but may not work with multi-band remotes used on a few satellite boxes. Look for 2 emitters on the nose of the remote. If you are pre-wiring make sure to run a 3rd cat5 cable so you can add an IR system that can handle multi-band remotes. If you have multi-band remotes you might want to upgrade your remotes to UHF, which goes through walls. This will bypass the IR system completely on the unit. Q: Does this HDMI over 1 - CAT5 cable support 3D or 4K? A: No, please see our 4K HDMI to CAT5 Extenders. Q: Does the remote IR work with a HDMI matrix switch or HDMI splitter? A: These HDMI extenders will send both HDMI video and audio from a matrix or splitter, etc but the remote IR is designed to be used with only one source, like a cable box, to one widescreen. There would be too many IR cables to attach on the sources IR window. See our HDMI switchers and splitters that have it integrated. HDTV Supply includes a 1 Year Limited U.S. Warranty on this HDMI over CAT5. The U.S. warranty states that (a) its products will perform substantially in accordance with the accompanying written materials for a period of 1 year from the date of receipt and (b) that the HHDMI over CAT5 will be free from defects in materials & workmanship under normal use & service for a period of 1 year. In order to get a warranty replacement for a defective item, HDTV Supplys Support Team will verify the product is eligible for warranty. An RMA number will then be issued. Shipped replacements will be in like new conditions, tested and all components included. A 30-day RETURN also comes with this warranty as well as Free Lifetime Tech Support. HDTV Supply also sells a 3 and 5 Year Extended U.S. Warranty for this HDMI Extender Over CAT5. Please go to Extended Warranties or see the above Options to purchase it. If this HDMI Over Cat5 doesn't meet your needs see our HDMI over CAT5e/6 comparison spreadsheet for other HDMI to CAT5e/6 extenders with different features or call us right now at 800-841-9238 to discuss your requirements.